The Sultanate of Oman has identified national carrier Oman Air as a key enabler for its vision to make the country an air-sea logistics hub and tourism center in the region. Now flying a fleet of 55 aircraft consisting of Airbus A330s and Boeing 777s, 787-9s, and 737 Max narrowbodies, Oman Air expects its inventory to grow to 70 airframes by 2022. Oman Aviation Group CEO Mustafa bin Mohammed al Hinai told AIN that the airline would submit a request for proposal for new widebodies next year. “We are looking on maximizing our asset growth to create connectivity,” he noted. The carrier’s biggest destinations remain points in the Gulf countries, India, France, and Italy, and potential new markets include cities in China, Russia, and Northern Africa. “Our focus is to make Oman a destination,” said Oman minister for transport and communication Ahmed Al Futaisi. Transit passengers now account for some 70 percent of all of Muscat’s traffic, and plans call for an increase in point-to-point traffic from 30 percent to 40 percent. “Oman’s strategy is changing,” Mohammed Nasser Al Zaabi, CEO of Oman’s Public Authority of Civil Aviation, told AIN. 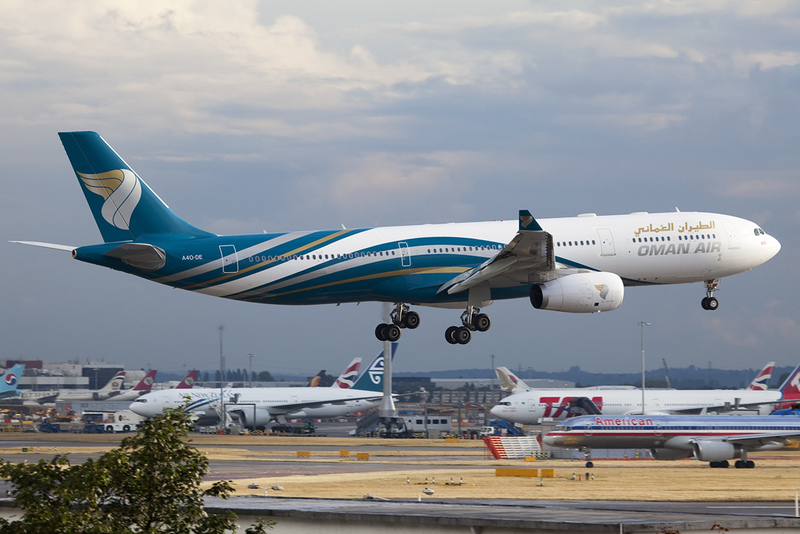 Oman Air in one respect has benefitted from the geopolitical crisis in the region as airlines based in major neighboring countries suspended flights to Qatar last year for its ties to Iran and, allegedly, terrorism. Passenger growth increased by 17 percent in Oman last year compared with the previous year. “Many trips were rerouted from Doha to Muscat,” said Al Zaabi. “We have 1,600 aircraft overflying our skies…it may be because of the Qatar crisis,” he added. Meanwhile, new code-share deals with airlines including Bahrain-based Gulf Air have helped Oman Air expand its network. The main infrastructure project expected to facilitate Oman Air’s expansion—the new $5 billion Muscat International Airport—formally opened on November 12 and plans call multiple phases of development to result in a total capacity of 20 million passengers. The new airport offers 40 boarding bridges and two Code F runways to accommodate the Airbus A380. Oman Aviation Group formed earlier this year to create a “robust value chain” that links the country’s aviation, tourism, and logistics sectors. It comprises Oman Air, Oman Airports, Oman Aviation Services, Muscat Airport City, and Meteorological Navigation Services. The group is now considering a master plan for creating an airport city at Muscat International Airport, part of which would include a tax-free zone.